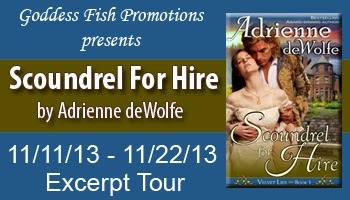 Love Saves the World welcomes Adrienne deWolfe and her novel, Scoundrel for Hire, the first book in her Velvet Lies series. Adrienne deWolfe is giving away a lot of great prizes on this blog tour. 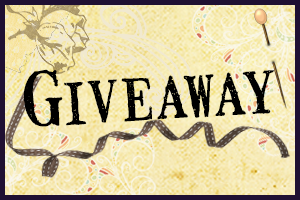 (Giveaway is through Rafflecopter). 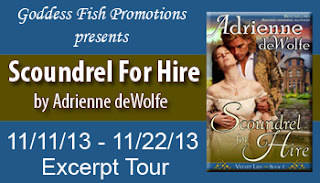 To visit Adrienne's other stops, click here. 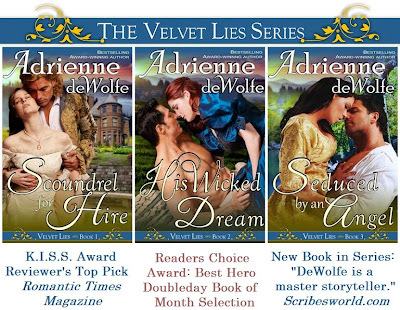 Now the wily scoundrel must choose: walk away or wager the one thing he can't afford to lose -- his heart. Silver stiffened, blinking back tears. She'd been prepared for all kinds of assaults by Raphael Jones, but never once had she thought she'd have to rally a defense against compassion. "Papa had no right to gossip about me," she told Rafe hoarsely, tightening her grip on the fire poker. "He thinks you hung the moon, Silver." She raised her chin. The traitorous thing quivered anyway. "What Papa thinks is none of your concern. Nor is it any of your concern how I used to spend my time in Philadelphia. Now kindly remove your otter from my bathwater and your presence from my bedroom!" The impish glint crept back into Rafe’s eyes. "You sure you wouldn't like some help, say... in scrubbing your back?" He smirked, pushing up his sleeve. "All right. All right. Tavy and I know when we're not wanted. Don't we, Tavy?" The otter pup's ears pricked at his croon, and she paddled closer, wrapping herself around the bared forearm he'd dunked into the water. He cuddled her close for a moment, then draped her, sopping fur, suds, and all, across the back of his neck. Rivulets of water rolled into his collar, soaking the lace at his throat and the velvet sateen of his waistcoat. Nevertheless, he rose with great aplomb, as if it were an everyday occurrence to have a wet otter nuzzling his cheek. "I fear you've made a poor impression on our hostess," he whispered sotto voce. Tavy sighed happily. When he kissed her snout, with its abundance of catlike whiskers, Silver suffered the most ridiculous pang of jealousy she'd ever known. Turning once more toward Silver, he pressed his hand to his heart. "Hereafter, in a better world than this, I shall desire more love and knowledge of you," he quoted in the melodious murmur she'd come to associate with his Shakespeare. "As You Like It, act one, scene two." Then he gave her a crooked grin. "A pleasant bath to you, mistress. I'm sure I shall never look upon lavender soap, paisley dressing gowns, and fire pokers in quite the same way." With that wicked sally, he sauntered from the room, dripping suds in his wake. Enormous brown otter eyes blinked back at her. Watching Tavy bob out of sight atop Rafe’s expansive, paternal shoulders, Silver secretly admitted that she would never view Raphael Jones in quite the same way, either. Hi, Tin! Thanks so much for hosting my tour! You have such a great website! I look forward to chatting with your readers. Hugs! 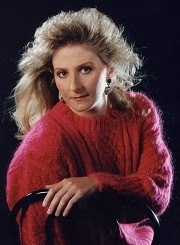 Howdy, Andra! You found me! (And more otter mischief) Thanks for dropping by. Hugs! Howdy, Rita! Thanks for stopping by . . . Natasha!!!! Welcome to the continuing Otter Bath scene . . . Hugs! Thanks, Glenda! Yes, it's true: Tavy is not your usual pet. Rafe likes to think of her as his "ward" - and he really is trying to return her to the wild. The trouble is, otters don't know how to swim at birth, and Tavy was orphaned before her mother could teach her how. So Rafe has to TRAIN Tavy, using Silver's bathtub. (He just doesn't bother to tell SILVER this fact . . . ) If you love otters, you'll find a couple other excerpts, featuring otter mischief earlier in my tour -- including the seance. Hugs! Hi, all! Agree that this was a fun excerpt! Thank you, Adrienne, for sharing this exclusively with our readers! Good luck to everyone! Have fun with the scavenger hunt! Hi, Emily! You like those classy, smooth-talking scoundrels, I can tell! ;-) ('Course, if you also like cowboy scoundrels who sing bawdy songs, you'll have to watch for my upcoming novella: SHADY LADY. Cass - who played the "other man" in the love triangle in SEDUCED BY AN ANGEL - has a couple of great naughty lyrics that he sings to the heroine.) Thanks for the kudos! Hugs! Thanks again, Tin! I've had so much fun chatting with all your readers. Glad I got to learn about your great website through Goddess Fish. Hugs! So glad you found us, Mary! Thanks for following my tour. Hugs!